during a break in the hunt. Sweepstakes occured the same weekend as my hunting trip, I kinda enjoy operating QRP on camping trips and thought this would be fun. 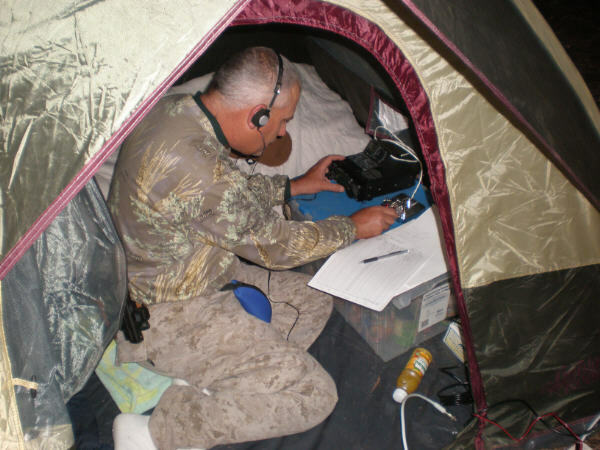 In fact it was operating SS 2007 during last year's pre-hunt camping trip that renewed my interest in Ham Radio and QRP. So I brought the IC-703 and batteries and during daylight, strung a 40m dipole 30' up a pine tree and the 20m wire ground plane from a Jackite pole bungeed to a bush with the radials starting about 6' above the ground. I was at 8360' in Northern Arizona, north of the grand canyon, DM36VP - 36deg 38.754' north, 112 deg 14.058' west. Surrounded by tall pines. The Rig and paddle were set up on a food box inside the test and I pretty much had to kneel on the ground and operate by lantern light, log with a pencil, dupe by scanning down the log real quick. kinda like Field Day only less comfortable. I was only able to operate about 6 or 7 hours total, mostly after dark. I was hoping to get 100 QSOs but only got to 99. QRP is tough with limited antennas and time. I didn't think I'd be able to re-rig an antenna in the dark, that's why I put up 2 before dark, I should have strung an 80m dipole off the same coax as the 40m and I wonder if a dipole on 20 wouldn't have been better than a vertical in amongst tall pines (whose sap-filled trunks are also vertical). I had planned to put the 40m vertical wire up on the fiberglass pole but decided on the dipole for that reason. I had not gotten a deer since 10-Nov-96. I put in plenty of times but never saw a buck that I could get a shot at. Was drawn for 12A West, North Kaibab in '04, it was cold, Zurek got a deer, I did not. Got drawn again in '08. Didn't even bother to scout, but when season came around it was not as cold (global warming?) as it had been 4 years earlier. Scouted thursday and that was cut short when I got a flat tire, some guy with a compressor helped me out and the guy at the service station at Jacob Lake patched it for me, so I was ready for friday. Camped at 36deg 38.754' north, 112 deg 14.058' west about 6 miles south of the check station off 282. 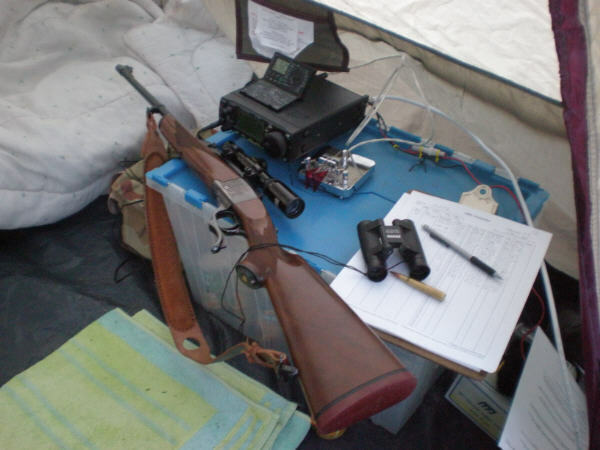 Hunted hard off and on for 4 days, played ham radio a little from camp (see that write up). Saw a buck sunday morning I think it was about 0.5 miles from camp. Steve left at noon monday, Took it easy that afternoon, then went out to where I saw the buck the other morning. 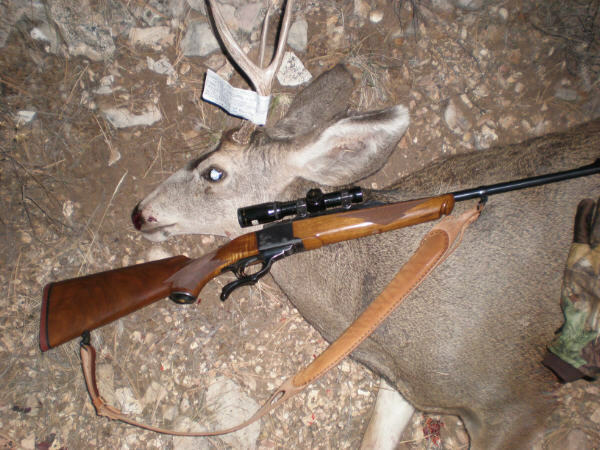 at 5:30PM (friday 3-Nov-08, election eve) it came walking by, maybe 50 yds away, one shot from the (AZGFD-provided) copper bullet, which went right thru and into the dirt beyond, it ran or trotted maybe another 50 yds, never out of view, slowed, stumbled, kicked, fell, rolled under a tree at 36 deg 39.093 north 112 deg 14.710 west. I got up to it before it died and finished it in a manner some of my friends would approve of (حلال) and then took a few pictures, tagged it, more pics and started gutting it. I was mostly done and it was getting dark when I heard a truck on a nearby road (that I didn't even know existed, the road past fracas lake). I shouted and they stopped, 5 guys came up the hill, helped me finish gutting carried it to their truck and drove me back to camp (if they had not come along, I'd still be up there). I walked to my truck (18 minutes away) and then at camp fingered out how to hang it in the tree (it was over 100 lbs too heavy for me to lift) and then had a bit of tenderloin for dinner and was up till midnight skinning it. Stopped by the check station at noon on the way home, mine was neither the smallest nor largest there. Took it to http://millersouthwest.com/ wednesday. last modified by Bill Poole on 12-Oct-09, 20-Nov-08, ©.